The above photos show different views of Venus transiting the Sun on June 5, 2012; the photo at top right (showing third contact) was observed from Tehran, Iran, the photo at top left from Chandler, Arizona and the lower photo was snapped from near Potsdam, Germany. From here on Earth, Venus can only be seen transiting the Sun when its orbital path is aligned with that of Earth and when both planets are on the same side of the Sun. This rarely occurs and does so in pairs that are about eight years apart. The last transit occurred in June of 2004; the next one will happen in December of 2117. Venus’s orbit is inclined 3.4 degrees with respect to the Earth’s orbit, and it intersects the ecliptic at two nodes that cross the Sun every year in early June and again six months later. Transits only happen if Venus passes through inferior conjunction (when Venus is directly between Earth and the Sun) in early June and or early December. However, in all but one or two occasions a century, Venus passes too far above or below the ecliptic and so never crosses in front of the Sun. 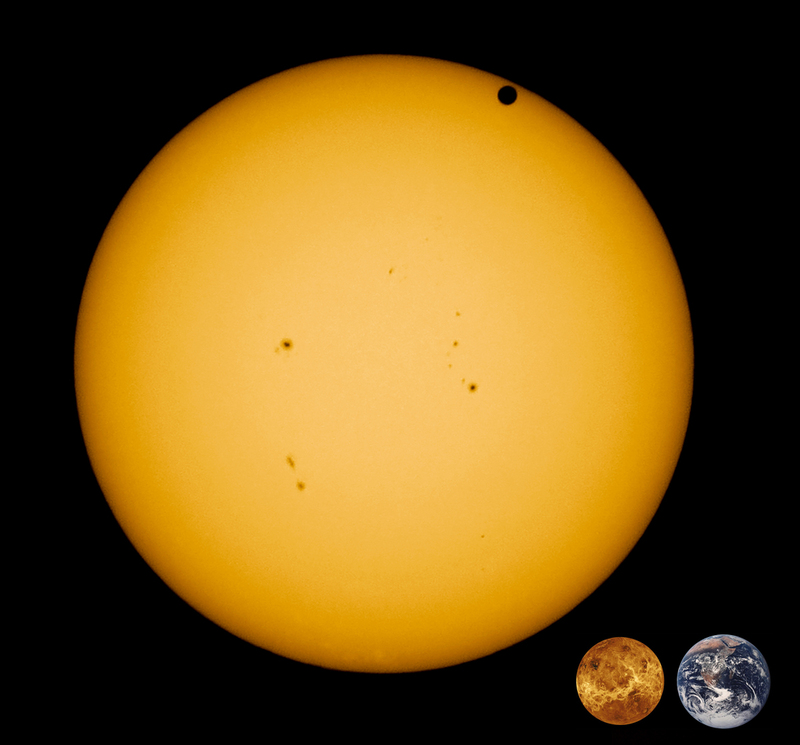 During the past 6,000-years, just 81 transits of Venus have occurred. Photo details: Top left - Camera Maker: Canon; Camera Model: Canon EOS 40D; Exposure Time: 0.0005 s (1/2000); ISO equiv: 100; Exposure Bias: none; Metering Mode: Matrix; Exposure: Manual; Exposure Mode: Manual; White Balance: Manual; Flash Fired: No (enforced); Orientation: Normal; Color Space: sRGB; Software: Adobe Photoshop CS5 Windows. Top right - Camera Maker: Canon; Camera Model: Canon EOS 60D; Focal Length: 50mm; Exposure Time: 0.0005 s (1/2000); ISO equiv: 200; Exposure Bias: none; Metering Mode: Matrix; Exposure: Manual; Exposure Mode: Manual; White Balance: Auto; Flash Fired: No (enforced); Orientation: Normal; Color Space: sRGB; Software: Adobe Photoshop CS5 Macintosh. Short animation from the orbiting Solar Dynamics Observatory during the transit of Venus -- from 11:00 p.m. on the 5th until 6:00 a.m. on the 6th. Thanks to Greg Parker for this.